Front row from left: Moundsville Mayor Gene Saunders, McMechen Councilman David Goddard, WV House of Delegate Mike Ferro, Benwood Mayor Ed Kuca, MCBOE President Thomas Gilbert and Cameron Mayor Betty Scott. Back row from left: Marshall County AFT Representative Josh Gary, Marshall County AFT Representative Amy Kent, Marshall County Education Association Representative Matt Mandarino, JM Principal Cassie Porter, MCBOE Member John Miller, WV House of Delegate Joe Canestraro, Marshall County Sheriff Kevin Cecil, Marshall County Commissioner John Gruzinskas, Marshall County Commissioner Scott Varner, Marshall County Schools Superintendent Jeffrey Crook, MCBOE Member Dr. Duane Miller and Marshall County Schools Assistant Superintendent Corey Murphy. 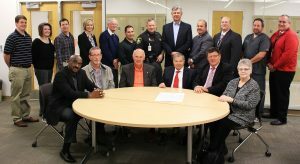 On Wednesday members of the Marshall County Commission as well as the mayors of the cities of Marshall County, members of the Legislature along with the Sheriff and local business leaders gathered to sign the proclamation declaring November 13-17, 2017 as American Education Week in Marshall County. The theme this year is Great Public Schools: A Basic Right and Our Responsibility. Also attending the signing were members of the Marshall County Board of Education, administrators of Marshall County schools, administrators from John Marshall High School and representatives of the West Virginia Education Association and American Federation of Teachers. American Education Week spotlights the importance of providing every child in America with a quality public education from kindergarten through college, and the need for everyone to do his or her part in making public schools great. A short luncheon, prepared by the JM ProStart students, and a brief tour of the John Marshall High School facilities followed the signing. 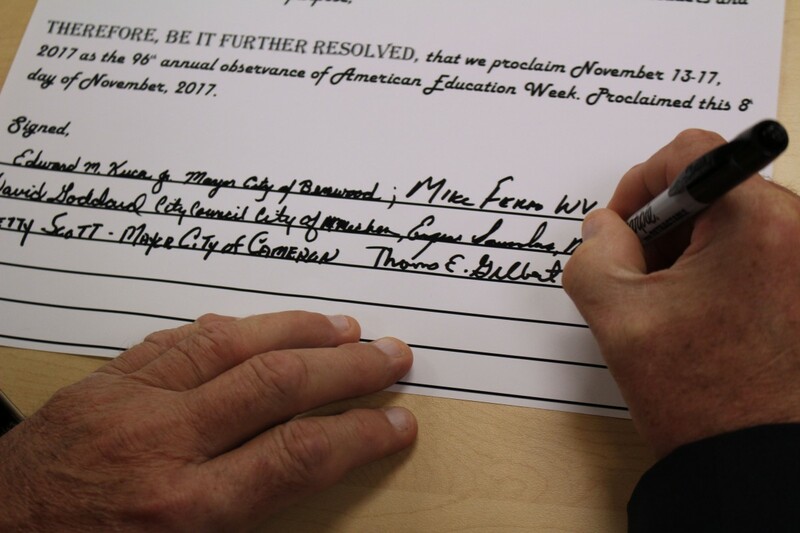 Therefore, be it further resolved, that we proclaim November 13-17, 2017 as the 96th annual observance of American Education Week. Proclaimed this 8th day of November 2017. Special Olympics athlete Bryan Belford, a 6th grader at Cameron Elementary School, competes in the annual swim meet while his peer tutor from Cameron High School, Kaia Leasure, looks on in the backgound. 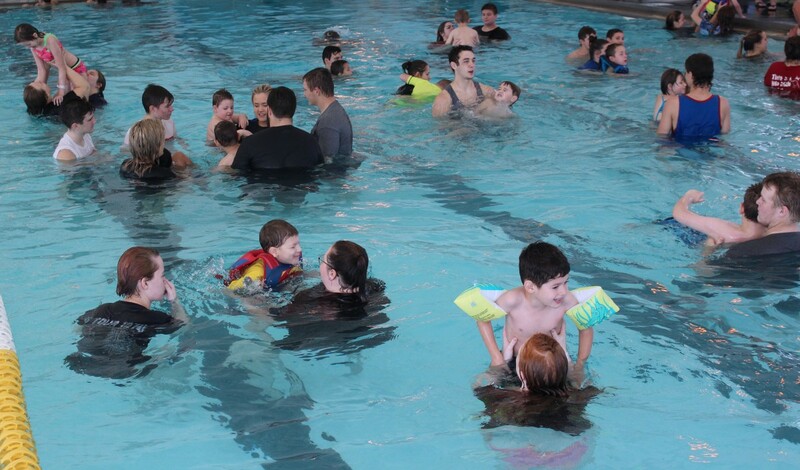 Marshall County hosted its 30th annual Special Olympics Swim Meet on Thursday. This event was for students and adults. The swim meet consisted of 75 peer tutors and 110 participants. The peer tutors were from John Marshall High School and Cameron High School. Teachers and peer students helped with the swim meet for the students. 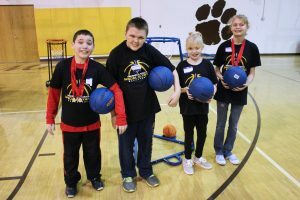 “The peer students learn a lot,” explained Marshall County Special Olympics Co-Coordinator Catherine Folmer. “They learn how to work with other students. They also get a sense of pride in helping the athletes”. The athletes competing earned ribbons for first, second and third place in different events. The swim meet started with the elementary school kids in the morning and in the afternoon middle school, high school and adults competed. For parents wishing to have optional student accident insurance coverage, Marshall County Schools has partnered with QBE Insurance to offer optional policies. There are many different coverages available such as school time accident, 24 hour accident, football, dental, AD&D and more. 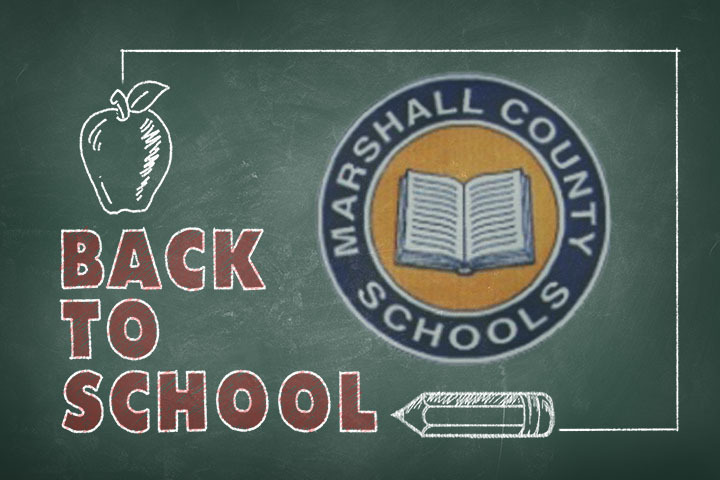 The Marshall County Schools 2017- 2018 academic year began Thursday for students in 1st through 12th grades. Students from the district picked out their favorite outfit and grabbed their new school supplies to head back to class. The first day of class for kindergarten students is Monday, August 21, 2017. Parents with a student attending WV Universal PreK will be notified about the orientation which takes place on Monday, August 28 and Tuesday, August 29. WV Universal PreK classes begin on Wednesday, August 30, 2017. 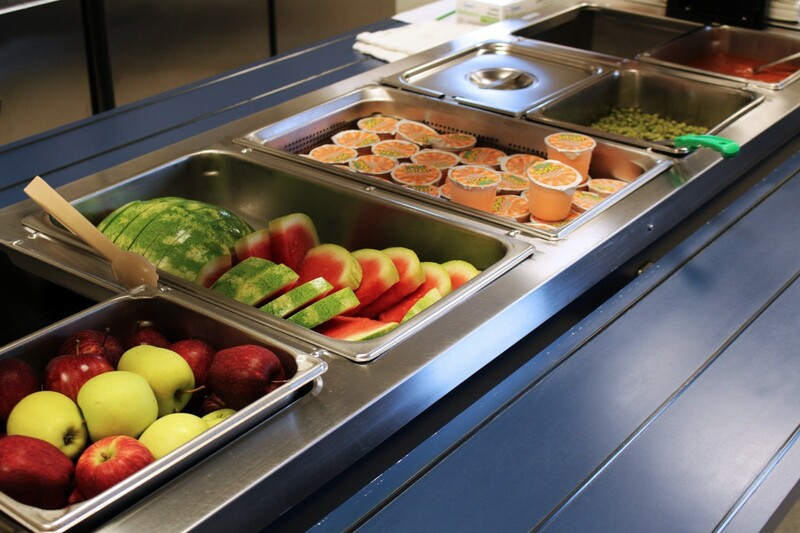 The Marshall County Board of Education announces its sponsorship of the federally funded Summer Food Service Program. Nutritional meals will be provided to any child 18 or younger. Free breakfast and/or lunch will be served at two different locations. May 30 – June 16 (Mon – Fri) breakfast will be served from 8:00 a.m. until 8:30 am. and lunch will be served from 11:30 a.m. until 12:30 p.m. at John Marshall High School. June 27 – July 27 (Tue, Wed, Thu) breakfast will be served from 8:00 a.m. until 8:30 am. and lunch will be served from 11:30 a.m. until 12:30 p.m. at Moundsville Middle School. 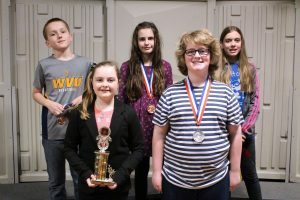 For more information about the Marshall County Summer Food Program, please call Child Nutrition Director Debbie Derico at 304-843-4400 extension 346. 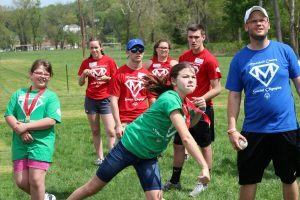 Alexis Lewis (center) participates in the softball throw while her friend Jessi Donely (left), high school peer tutors (background) and Coach Shane Healy (right) watch during the Special Olympics. 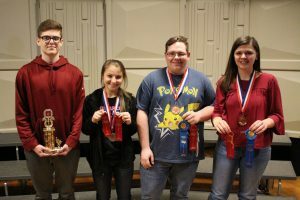 More than 130 student and adult athletes participated at the 30th annual Marshall County Special Olympics Track & Field event at John Marshall High School. 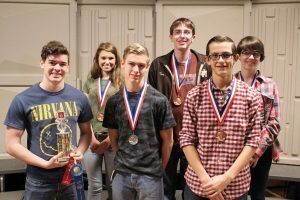 Athletes were assisted by the 160 peer tutors from both Marshall County high schools, Cameron and John Marshall, while competing in various track and field events. Participants could also make arts and crafts. This years’ theme was Superheroes. Everyone received a t-shirt featuring an original superhero design by John Marshall High School student Katie Robinson. Several JM Career & Technical Education programs helped at Special Olympics. Agriculture students prepared and set up the field for the spring games. Nursing students in the Therapeutic Services program provided a first aid station and assisted with physicals. JM Pro Start students prepared lunch while WJMH Media students announced results and played music. 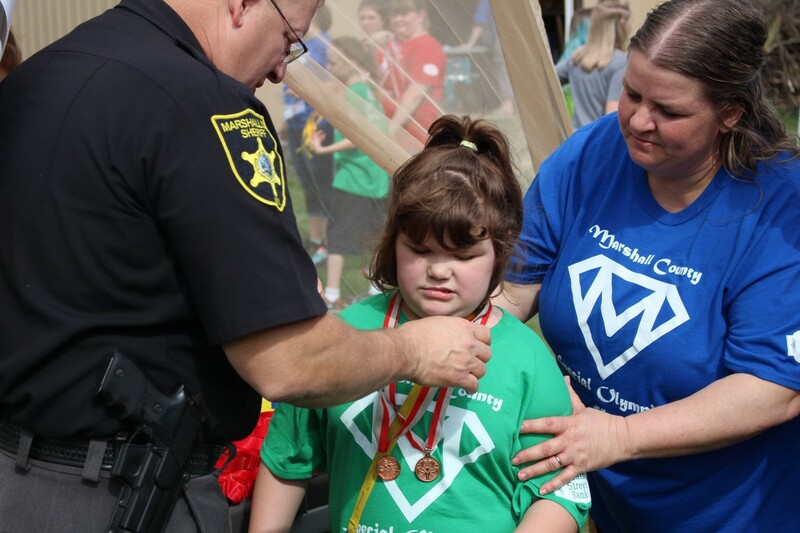 The Knights of Pythias, American Legion, Army National Guard and Wheeling Jesuit University also lent a helping hand during the Marshall County Special Olympics Spring Games. 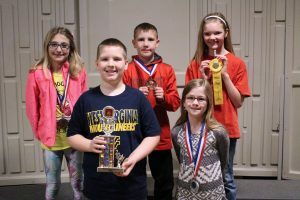 Students in grades 4th through 12th participated at the annual Marshall County Math Day competition at Sherrard Middle School on Saturday, February 18, 2017. 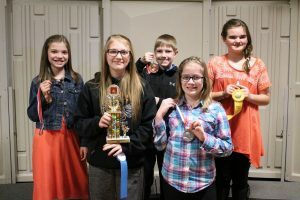 Approximately 150 students competed in categories ranging from mental math, mental estimation, measurement estimation and short answer. Participants also took a written test. 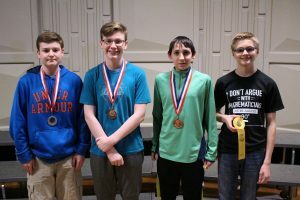 Students who placed 1st through 4th in each division advance to Regional Math Day on Saturday, March 25, 2017 at Wheeling Park High School. We need your input to help create the 2017 – 2018 School Calendar. We will gather the results and use them to help decide which vacation days to include on next year’s calendar. Click the Read More link to click the active link to the survey or visit https://www.surveymonkey.com/r/mcs17-18. 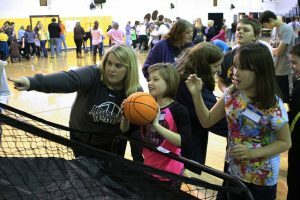 From left: Coach Chelsea Eikleberry helps Special Olympics athletes Ayla and Elizabeth with their foul shots. 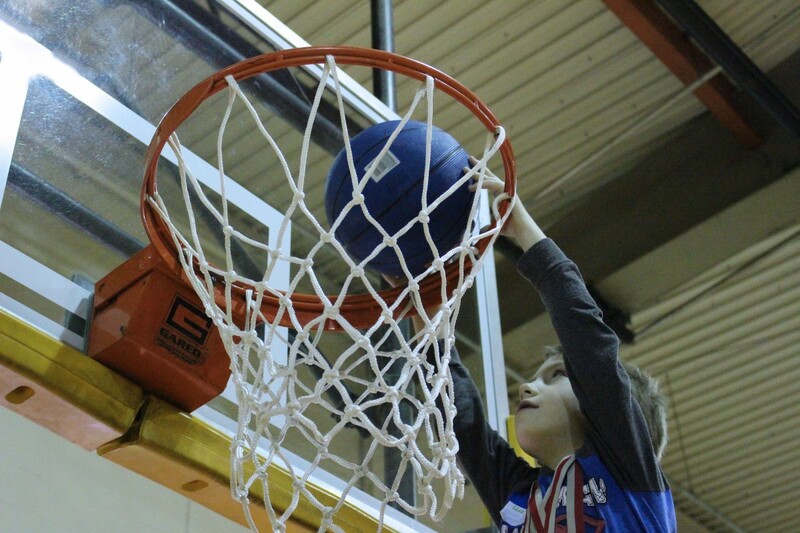 More than 130 Marshall County Special Olympians participated at the county’s basketball event recently at John Marshall High School. Peer tutors from both Cameron High School and John Marshall High School assisted the athletes while shooting hoops. 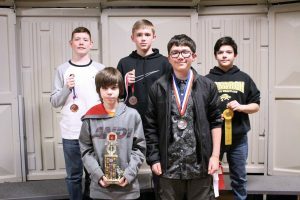 Knights of Pythias and American Legion members handed out medals and also donated money to help fund the Winter Games. 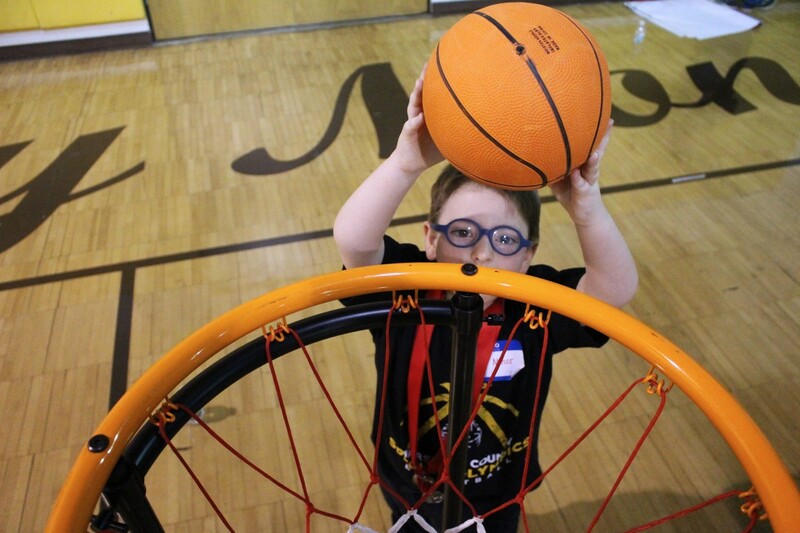 This is the second time the Marshall County Special Olympics organization has held its basketball event, replacing bowling. The annual Marshall County Special Olympics Track and Field events will take place on the Monarch’s Soccer Field in Glen Dale on Thursday, April 27, 2017.